If critics of Confederate monuments truly want to accomplish their goal of removing such objects from the public square, I’m a good example of the kind of person they ought to be trying to persuade. I’m a native North Carolinian. While I have relatives who fought and died on both sides of the War, most wore gray, not blue. Confederate Gen. John Bell Hood was a cousin of my great-great grandfather and has always been a subject of great personal interest to me. On the other hand, I’m no devotee of the Lost Cause. Although my love of state history is broad and deep, it does not extend to the Confederacy itself, the founding principles of which I view with contempt. Not only do I celebrate the abolition of slavery, the destruction of Jim Crow, and the expansion of freedom, but I also believe these events deserve far more official commemoration than North Carolina has yet erected. Similarly, the Z. Smith Reynolds Foundation has just announced its Inclusive Public Arts Initiative, which will fund up to 10 new projects across the state with grants of up to $50,000 each. The intent is to “share stories of diversity, equality, inclusion and equity as they relate to the people and places of North Carolina, especially those whose stories have not been or are often untold,” the Foundation stated. Why not erect more monuments and public art to commemorate a broader range of individuals, movements, and events? That’s a noble enterprise that could unify North Carolinians across the political spectrum. Indeed, the grantmaker for which I serve as president, the John William Pope Foundation, helped pay for a mural painted several years ago at North Carolina Central University’s law school. It celebrates the Declaration of Independence, the Constitution, the Bill of Rights, and the post-Civil War amendments that abolished slavery, expanded the franchise, and promised due process and equal protection of the laws. 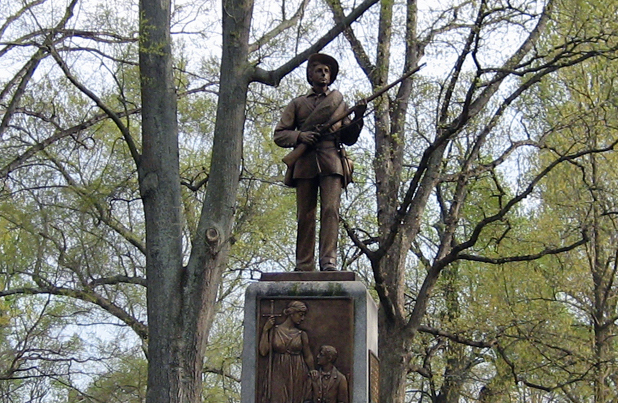 So, given these views, why am I dismayed by the attacks on the University of North Carolina at Chapel Hill’s memorial to Confederate soldiers (“Silent Sam”), the Civil War monuments on the State Capitol grounds, and other statutes and memorials across the state? Why do most North Carolinians — by a two-to-one margin, according to an Elon University poll last year — oppose the removal of the monuments in question? Some defend the historicity of the objects themselves. Others would prefer to add context to the monuments rather than tear them down or move them to remote locations, which feels like flushing them down a memory hole. Still others make a distinction between memorializing those who fought or died and celebrating the politicians who provoked or carried out secession. For me, however — and I know I’m not alone — the most compelling reason for objection is that the monuments aren’t just being attacked rhetorically. They’re being attacked physically. Silent Sam has been defaced and is now under constant and costly surveillance. In Durham, activists tore down a Confederate monument on camera, then got away with it, and are now threatening to tear down any replacement that may be erected. Mob rule is inconsistent with the principles of a free society. We simply can’t have people defacing or destroying public property because legal attempts to redress their grievances haven’t yet succeeded, or attempting to coerce government agencies to comply by threatening criminal action and running up the security tab. To yield to such extortion would set a horrible precedent and outrage most North Carolinians. Every time someone cracks open a can of spray paint or threatens to pull down a statue, the movement to remove Confederate monuments loses public support instead of gaining it.